108 pages | 59 Color Illus. | 10 B/W Illus. 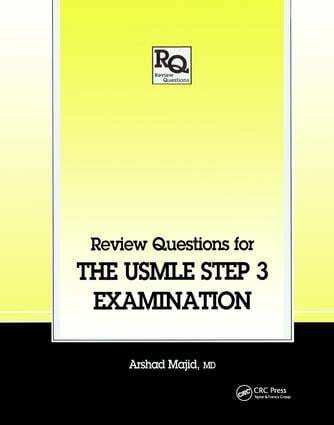 The United States Medical Licensing Examination (USMLE) Step 3 is the final step of the USMLE examination series. The focus of the Step 3 examination is on the clinical sciences, physical examination, data interpretation, and appropriate management in different clinical settings. Review Questions for The USMLE Step 3 Examination contains over 400 'high yield' questions carefully written to cover the material typically found on the actual exam, allowing you to identify areas that need greater focus in your preparation. In addition, like the actual exam, this review book contains high quality color plates in a special section of the book. It is clearly not possible for any text to cover all the material encountered on the actual examination. However, there are certain topics, because of their clinical importance, that are examined year after year. Providing coverage of favorite USMLE topics and an easy-to-use layout, this book familiarizes you with the format of the examination and the areas that need further study in your overall preparation. You can work through this book piece by piece, focusing on the subjects in any order that is convenient for you. Or you may work through the book by simulating the examination and becoming familiar with the format and time limit. Review Questions for the USMLE Step 3 Examination helps you focus and plan the time you need to study, and the areas in which you should put most of your efforts.